Did you know why we call capital letters upper case and small letters lower case? Well that’s something I found out at Robert Smail’s Printworks, a National Trust for Scotland property in Innerleithen. In the print room, capital letters were stored in the top or upper case and small letters, yes you’ve guessed it. The Caseroom is set in the printing industry in Edinburgh in the late 19th and early 20th centuries, where young Iza Ross is one of only a few women compositors. Iza is an ambitious and intelligent young woman in what was very much a man’s world. She was accepted by some in the industry but not others including within her family. Some saw women as a threat to men’s jobs, taking jobs that should have been men’s and lowering wages. The first chapter caught my attention. I liked the author’s style of writing, her use of dialect not just within speech but also in main body of the story. There is not so much dialect as to be impenetrable to non-Scots, but just enough to set the scene and add to the authentic feel of the characters. The focus is firmly on Iza throughout and although I found her difficult to warm to at first, she was an interesting and strong character. The Caseroom is a book rich in historical detail. It gives a fascinating insight into working life and social conditions for women in late 1800s. There is much about worker’s rights and trade unions but mainly this was about creating better conditions for working men not their female counterparts. The relentless grind of hard work, trying to make ends meet and feed the family is clear throughout. Iza is unusual for her time in that she is determined to carry on with her trade not just after marriage but also after a family comes along. I was particularly interested in the rise of the ‘We Women’ and suffrage movements and having seen a photo of the women’s march along Princes Street in at the Museum of Edinburgh recently, could easily imagine Iza really beginning to consider how best to support her cause and the cause of women in general. 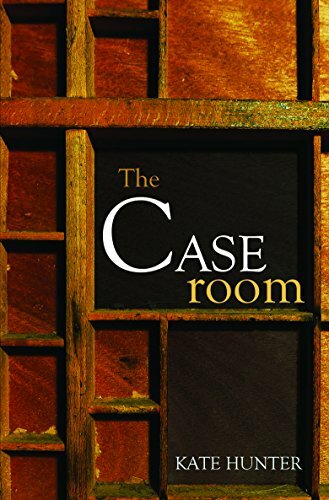 The Caseroom is clearly a very well-researched book with lots of detail building up a vivid picture of the social conditions faced by women in the late 1800s and early years of the 20th century. Iza is a strong central character bringing to life the struggles of women to improve their place in society. Kate Hunter’s father’s family earned a living in the Edinburgh print trade. They made books and newspapers; they read them, but they never got the chance to write them. Kate has read thousands of books and helped to make a fair few. Now she has written one.